When defining a rule mapping to provision members of AD/LDAP groups to new groups in apps, you can use regular expressions (regex) to select and refine the groups you'll use for provisioning. For example, you can use regex to match the AD/LDAP groups that will be used to create groups in the app and provision users to them. Only the users in the selected groups will be provisioned to the newly created groups in the app. Following are a few regex examples that you can use on your security group data. Note that the Check Rule with Users feature on the Edit Mapping page does not apply to the type of rule we are defining here. Specifically, the feature does not apply to rules that use the Map from OneLogin option in the Actions area. For this reason, we recommend that you use Rubular, a regex editor, to help you write and test your regex. Important: In Rubular, set the Ruby version field value to 1.8.7 to ensure that the regex you write is compatible with our mapping functionality. In Rubular, you'll need to enter a test string that matches the format of your AD/LDAP group data in OneLogin and then write and refine a regex that selects and captures the pieces of data that you need to perform group provisioning. To create the test string that you can paste into Rubular, you'll need a representative snippet of your group data. In OneLogin, member_of values are semicolon-delimited. Before applying the regex, our provisioning service removes the semicolons. We'll use this data to demonstrate the following regex examples in action in Rubular. While this article cannot serve as a comprehensive guide to regex, we can provide a few regex examples that you can use as a starting point in Rubular. 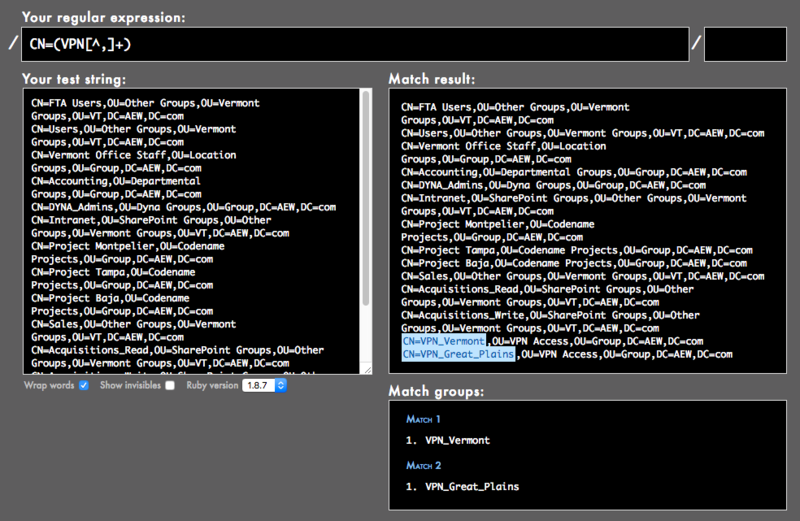 Adjust the regex based on the match results displayed by Rubular until the regex meets your exact use case. 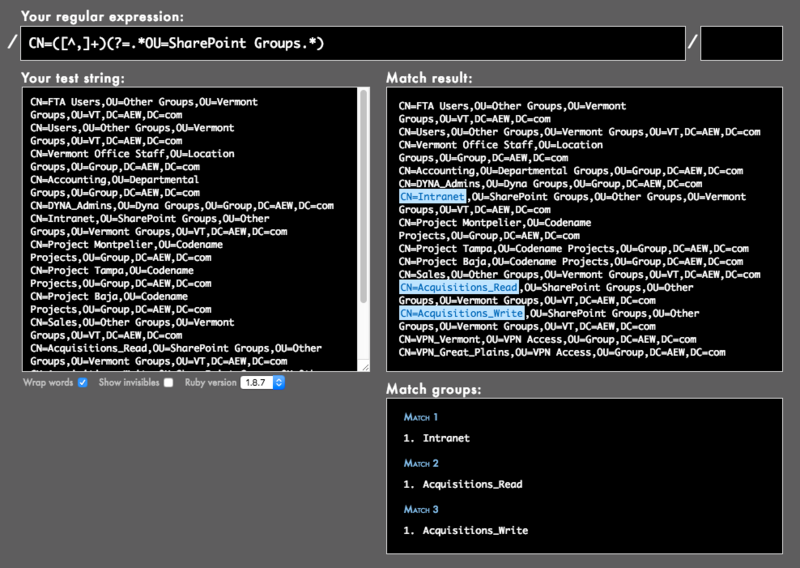 As shown in the following screenshot of Rubular, this regex will match member_of values that contain an exact match for OU=SharePoint Groups. It will also capture the CN value and make it the group name. 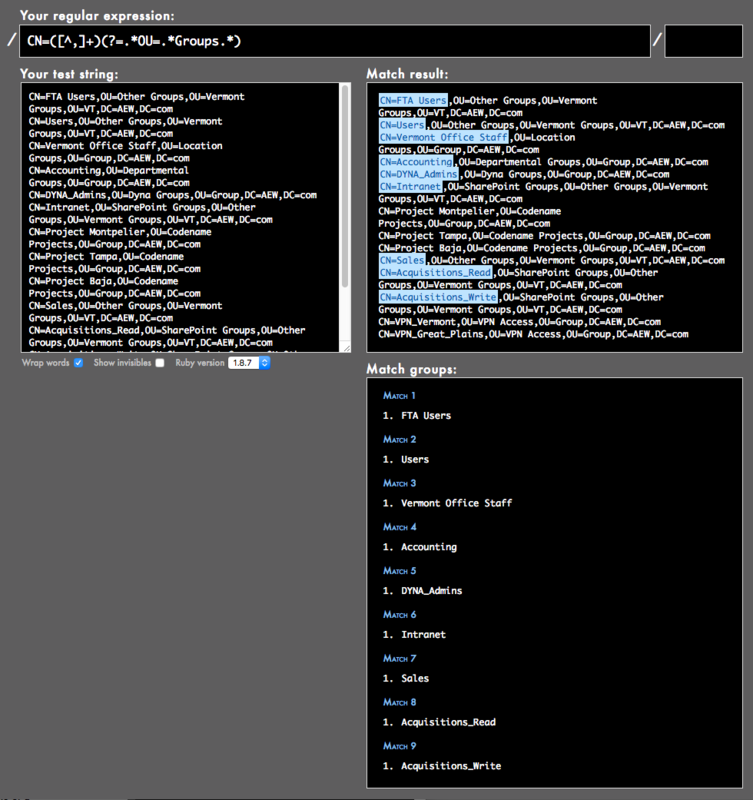 Test out this regex and test string in Rubular. As shown in the following screenshot from Rubular, this regex will match member_of values that contain OU values that contain Groups. It will also capture the CN value and make it the group name. As shown in the following screenshot from Rubular, this regex will match member_of values that contain CN values that start with VPN. It will also capture the CN value and make it the group name.